14 Sep 2015 — The Department of Work and Pensions (DWP) published guidance to Jobcentre officials who decide whether claimants should have their payments stopped. I have compiled a list of the deceased and those who have been adversely affected using the information from these sites http://twishort.com/0x9gc http://blacktrianglecampaign.org/…/uk-welfare-reform…/ https://welfaretales.wordpress.com/…/death-after-fit…/ https://welfaretales.wordpress.com/…/list-of-welfare…/. I fully agree with the assertion of Welfare Tales that these are the deaths that we know of because a friend, relative or the coroner has commented. Sadly to say there are probably many more and as more of these horrific cases come to light. They will never be forgotten, by their families, friends and those who they touched in their day to day lives. If you are feeling suicidal, please speak to your doctor and / or someone close to you. Or please call The Samaritans on 08457 90 90 90. Stephen Lynam Aged 53 He suffered from Anxiety and Depression as well as high blood pressure, a heart condition and muscular-skeleton problems. Found Fit for Work, he waited for 22weeks to here that he his Mandatory Reconsideration had been refused and died not long after hearing that he could appeal the decision. Terry McGarvey, 48 years old. Dangerously ill from polycytheamia, Terry asked for an ambulance to be called during his Work Capability Assessment. He knew that he wasn’t well enough to attend his WCA but feared that his benefits would be stopped if he did not. Ian Caress, 43 years old. Suffered multiple health issues and deteriorating eyesight. Ian was found fit for work by Atos, he died ten months later having lost so much weight that his family said that he resembled a concentration camp victim. David Elwyn Hughs Harries, 48 years old. A disabled man who could no longer cope after his parents died, could find no help from the government via benefits. David took an overdose as a way out of his solitude. Paul ?, 51 years old .Died in a freezing cold flat after his ESA was stopped. Paul appealed the decision and won on the day that he lost his battle to live. Julian Little, 47 years old. Wheelchair bound and suffering from kidney failure, Julian faced the harsh restrictions of the Bedroom Tax and the loss of his essential dialysis room. He died shortly after being ordered to downgrade. Carl Joseph Foster-Brown, 58 years old. As a direct consequence of the wholly unjustifiable actions of the Job centre and DWP, this man took his own life. Ian Jordan, 60 years old. His benefits slashed after Atos and the DWP declared Ian, a sufferer of Barratt’s Oesophagus, fit for work, caused him to run up massive debts in order to survive. Ian was found dead in his flat after taking an overdose. Janet McCall, 53 years old. Terminally ill with pulmonary fibrosis and declared ‘Fit for Work’ by Atos and the DWP, this lady died 5 months after her benefits were stopped. Stuart Holley, 23 years old. A man driven to suicide by the DWP’s incessant pressure and threat of sanctions for not being able to find a job. Graham Shawcross, 63 years old. A sufferer of the debilitating disease, Addison’s. Died of a heart attack due to the stress of an Atos ‘Fit for Work’ decision. Chris Smith, 59 years old. Declared ‘Fit for Work’ by Atos as he lay dying of Cancer in his hospital bed. Nathan Hartwell, 36 years old, died of heart failure after an 18-month battle with the ­Department for Works and Pensions. Michael Connolly, 60 years old. A Father of One, increasingly worried about finances after his benefits were cut. Committed suicide by taking 13 times the fatal dose of prescription medicine on the 30th October – His Birthday. Jan Mandeville, 52 years old, A lady suffering from Fibromyalgia, driven to the point of mental and physical breakdown by this governments welfare reforms. 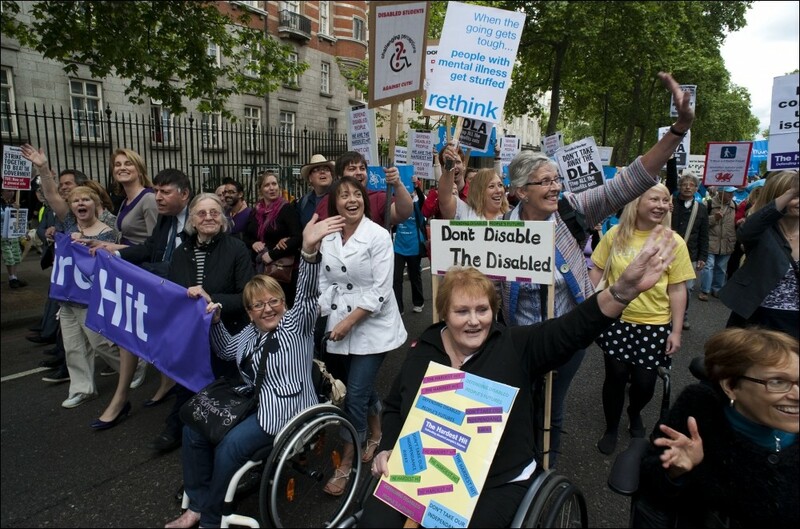 Jan was found dead in her home after battling the DWP for ESA and DLA. 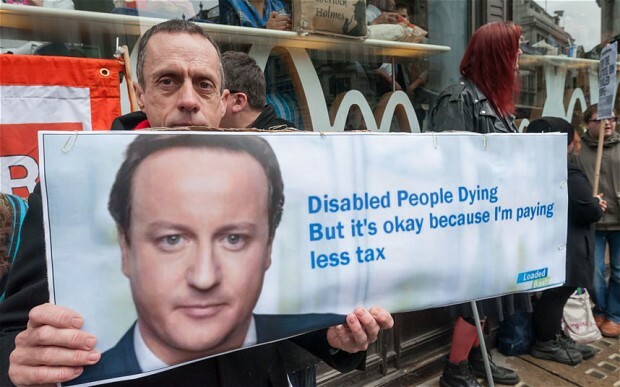 Unnamed, death of a severely disabled Dorset resident, who took her own life while battling the bedroom tax. Aaron Lane, 31 years old. A talented musician battling mental health problems took his own life after he was ruled fit to work. Glen Harris, 55 years old. Killed himself with an electric saw because he feared his benefits would be changed after being found fit for work. Peter Kelleher, 44 years old. Found in his flat with a ligature around his neck and in a state of decomposition after the pressure of mounting debt and no benefit at all became too much to bear. Elaine Lowe, 53 years old. Suffering from COPD and fearful of losing her benefits. In desperation, Elaine chose to commit suicide. John Walker, 57 years old. John found himself saddled with debt because of the bedroom tax, and took his own life as a result. Malcolm Burge, 66 years old. A retired gardener who killed himself after being hounded for £800 after changes to his benefits left him unable to cope. Benjamin Del McDonald, 34 years old. A doting Father of three children suffering from depression due to removal of his lifeline benefits, Benjamin committed suicide by hanging. Mark William Jacka, 26 years old. Stressed to the point of suicide, Mark was found hanged at his home the day after a visit to his local Job Centre to apply for JSA. David O’Mar, 58 years old. Suffering from Pneumonia in a hospital bed. Found ‘Fit for Work’ by the DWP only to die two weeks later. Moira Drury , 61 years old. Suffering from limited mobility, mini-strokes, epilepsy and depression. Her daughter believes that a seven-month delay in processing her benefit claim hastened her death. Nick Barker Former sheep farmer, Nick had a brain haemorrhage which left him struggling to walk. The father of two shot himself after the DWP claimed he was fit to work. Recording a suicide verdict, coroner Michael Oakley said the benefits assessment was key to the tragedy. Robert Barlow. Robert worked as a Government scientist but gave it up when diagnosed with severe cardiomypathy. The DWP deemed him fit to work. He died penniless under 2 years later. Thomas O’Donnell – He suffered from epilepsy, depression, arthritis and memory loss – yet was made to wait eight months for his Personal Independence Payment (PIP). Carly Canavan, 21, A severely disabled young woman with a mental age of a four-year-old ordered to prove she cannot work. Edward West. A Disabled Darlington man has been considered unable to work for the entirety of his adult life. Mr West lives in sheltered accommodation, has significant learning difficulties and needs the support of a carer several times a week. David Waite, 60 years old, suffers from a string of health problems including brain, damage neck pain, diabetes and depression. ..."The Nazis forced people with mental and other disabilities to wear black triangles in the extermination camps during the Holocaust. The generic classification they used was “Arbeitsscheu” – literally “Workshy”. This term is also the one most favoured in our right-wing tabloid press to described incapacity and disability benefit claimants today. Arafel: Recently our friend Jose (Bitterne Triangle Southampton), was on the phone to one of us saying how he had been complaining to The Job Centre concerning the amount of stress that the "Job-Search" commitments (forced on him when he lost his Disability Living Allowance and failed in his application for so called "Personal Independence Payment"), were causing him (he had a heart condition), when he stopped abruptly mid-conversation, my other friend (who is clearly still in considerable shock), went to his house only to find him lying dead on the floor having suffered a fatal heart attack. The Spaniard was a talented artist of the modernist school and a "known figure" around Portswood and Bitterne Southampton, where he had lived for years, walking his little dog (his only house companion), which has now lost its companion ("fascisti "old comrade" fascisti! "), Rest in Peace my friend.